Free Shipping Included! MXR M290 Phase 95 Pedal for Electric Guitars BUNDLED WITH 2 Pack of Blucoil Pedal Patch Cables AND 4 Pack of Celluloid Guitar Picks by blucoil at Worst Album Covers. MPN: A455. Hurry! Limited time offer. Offer valid only while supplies last. MXR M290 Phase 95 Pedal for Electric GuitarsThe MXR M290 is a phaser effects pedal for electric guitars that provides lots of modulation flexibility. The MXR M290 is a phaser effects pedal for electric guitars that provides lots of modulation flexibility. It sounds great on both sides of heavy grain. The Phase 95 pedal features a Script toggle switch, which eliminates feedback from the circuit. This produces a subtler vintage sound. These cables interconnect your guitar effects pedal while ensuring efficient and transparent signal transfer. These oxygen-free copper (OFC) cables make sure that the EMI and RFI noises do not interfere your signals. Get 4 additional Blucoil Celluloid Guitar Picks when you avail the MXR Bundle today! PRESENTS 2 SONIC FLAVORS IN 1 PEDAL - The MXR M290 utilizes iconic circuits from the Phase 90 and the more mellow version, Phase 45. The Phase90 is well-known for its subtle and spatial shimmer, while the Phase45 adds texture to your tone without overpowering the overall sound. DELIVERS 2- AND 4-STAGE PHASERS - You can toggle between two-stage and four-stage phasing with the 45/90 switch on the M290 Pedal. PRODUCES SUBTLE VINTAGE SOUND - This pedal features a Script switch, which removes feedback from the circuit to deliver a more pronounced 'swoosh' or a more subdued effect. OFFERS DURABILITY AND PORTABILITY - This lightweight phaser pedal comes in a mini housing that's about half the footprint of a standard MXR stompbox. The rugged housing ensures your M290 can withstand the rough handling on stage. 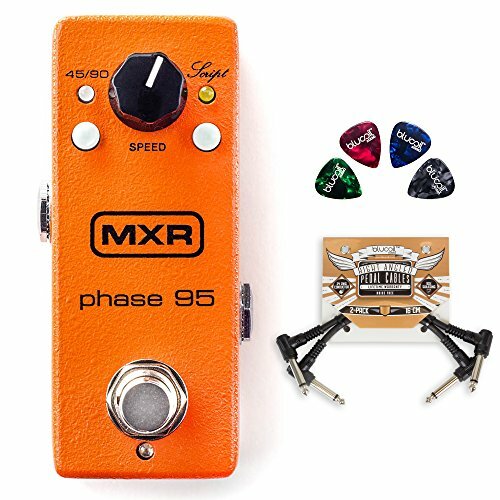 INCLUDES - MXR M290 Phase 95 Pedal for Electric Guitars. 2-Pack of Blucoil Patch Cables for Effects Pedals. 4-Pack of Blucoil Celluloid Guitar Picks. If you have any questions about this product by blucoil, contact us by completing and submitting the form below. If you are looking for a specif part number, please include it with your message.